Thanks Bradenton Gulf Islands for hosting our trip to Anna Maria! All opinions, as always, are my own. 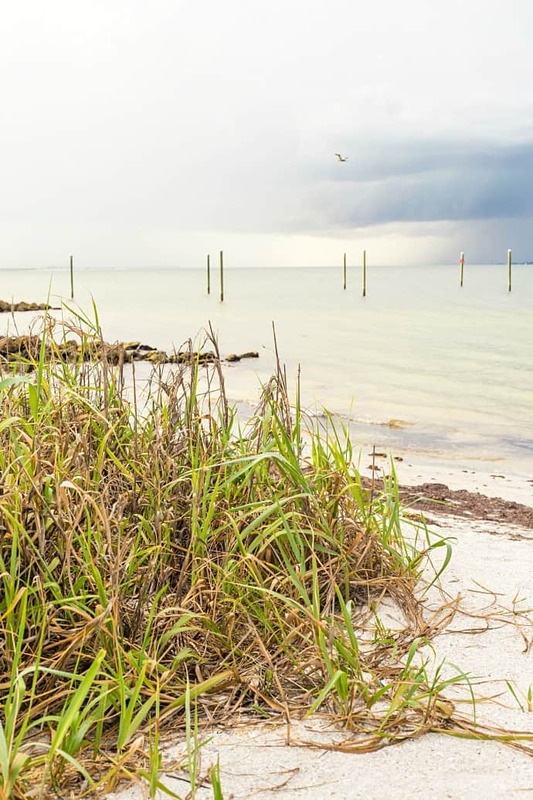 11 Amazing Things to do in Anna Maria – A guide that includes my top 11 things to do in Anna Maria! Includes great eats, the best shopping, and how to enjoy a little slice of paradise whether you are on a family vacation, girls’ getaway trip, or even for a romantic vacation as a couple! I am a beach gal at heart, and I couldn’t believe we haven’t been to the beach this year. I was so shocked. I shouldn’t be because I do not think we made it to the beach last year, and boy, was I missing it! Once our Anna Maria trip was booked, I was so excited to go! I haven’t been to Florida in many years, and I have never been to Anna Maria Island before. I haven’t even heard of it before. Let me tell you, friends, it was a little piece of paradise. It was a trip where I learned so much about myself, and I even learned it’s okay to be out of your comfort zone. So I put myself out there, and I even went parasailing! Keep reading to hear more about our parasailing adventure. With that being said, let’s get into my top things to do in Anna Maria. 1.) 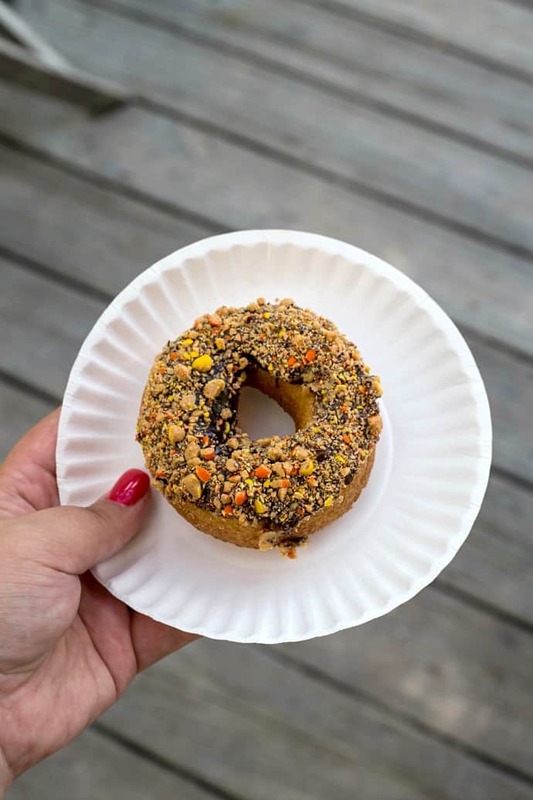 Donuts at the Donut Experiment – Even if you do not have a sweet tooth, like me, you will quickly fall in love with the donuts here. They are made-to-order donuts, and you start with a vanilla cake donut, then you pick your icing and toppings. I fell in love with the chocolate frosting and crushed Reese’s Pieces on top – so good! The possibilities are endless with 14 toppings. Be prepared for a little wait, this place is packed! 2.) 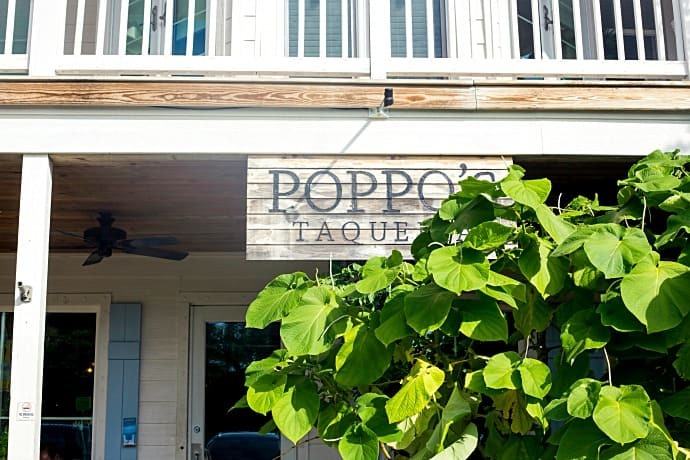 Have lunch at Poppo’s Taqueria – We stopped at Poppo’s for a delicious lunch after walking down Pine Avenue. Everything is made from scratch at Poppo’s, and there are so many options to choose from: burritos, tacos, bowls, and quesadillas. I tried a baby bowl, which was the perfect amount for lunch, and packed it full. I even topped it with pickled onions which I have never tried before and they were to die for! I think I may be a little addicted to them now. 3.) Dine at the Sandbar Restaurant – After a long day of traveling I was not hungry for dinner, but I was hangry. If you love seafood, you are going to love this place! Everything we tried was mostly seafood, and I was in food heaven: oysters, crab, clams, shrimp, you name it! I even went a little outside of my comfort zone and tried caviar. I can now say I tried it, but it wasn’t my cup of tea. The best part about the Sandbar Restaurant is enjoying a cocktail and dinner with your toes in the sand. Watching the sun go down was stunning over the water! 4.) Browse Shiny Fish Emporium – If you are looking for a quaint boutique shop where the owner is a doll, you need to stop by the Shiny Fish Emporium. There are so many boutique shops on Pine Avenue, but I fell in love with this one. So many cute things to purchase to remember your stay in Anna Maria. Not only can you buy specialty gifts, but there are so many kid’s crafts and activities to do. We enjoyed painting sand dollars! 5.) 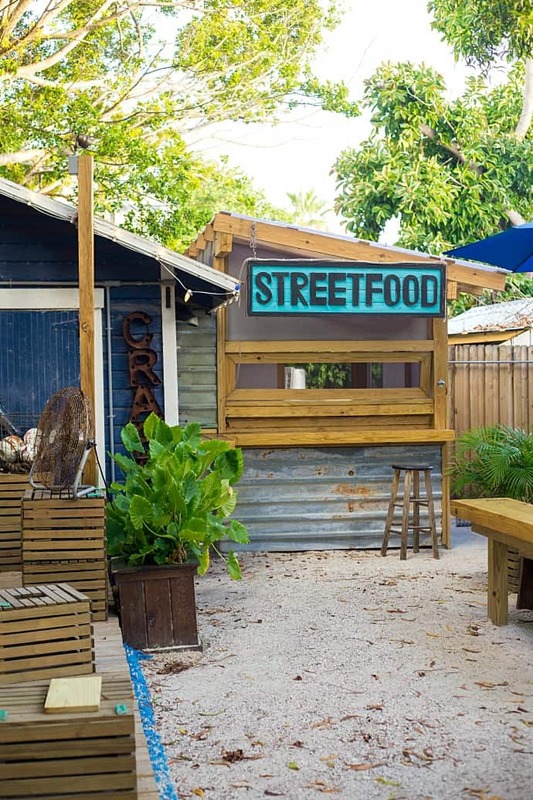 Dine at Blue Marlin – One of the best restaurants I tried in Anna Maria was the Blue Marlin – has so much charm, and the food was out of this world. I had a lot of fun snapping photos in their courtyard also known as, “The Trap Yard.” If you are into craft beer, you are going to love their local craft selection. 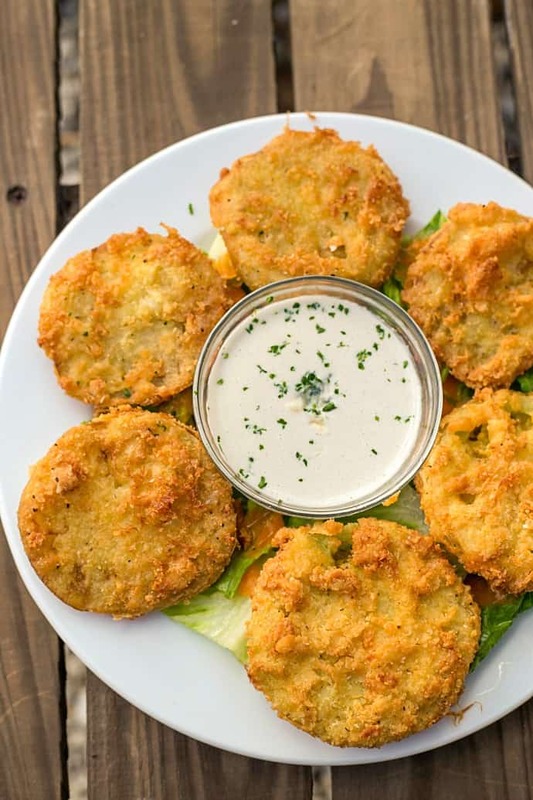 We started off with the most amazing fried green tomatoes, and I had the shrimp and grits for my entree. I ate every last bite! 6.) 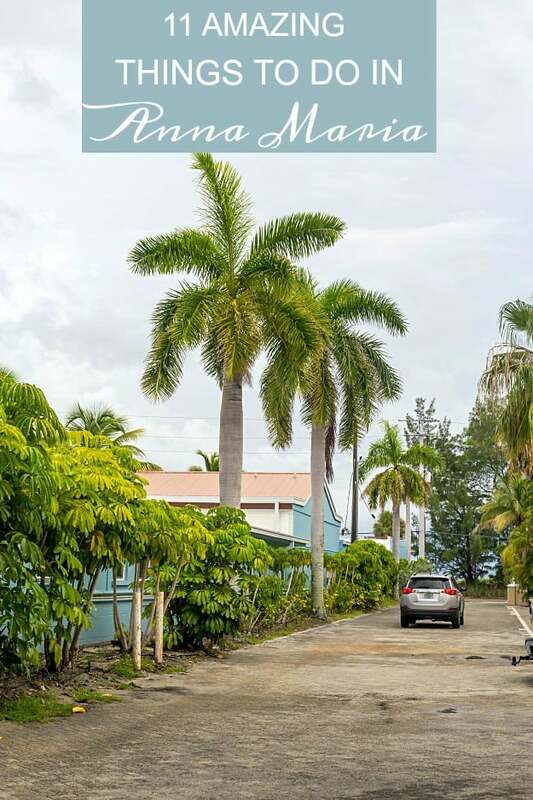 Tour Pine Avenue – One of my favorite activities in Anna Maria was taking a walk down Pine Avenue. It’s one of the top green projects in the state and region with its energy efficient, storm-strong buildings, community gardens, an LEED-certified Green Village, shops and boutiques where many are selling recycled, refashioned or vintage goods and items produced by local artists, and gourmet restaurants. 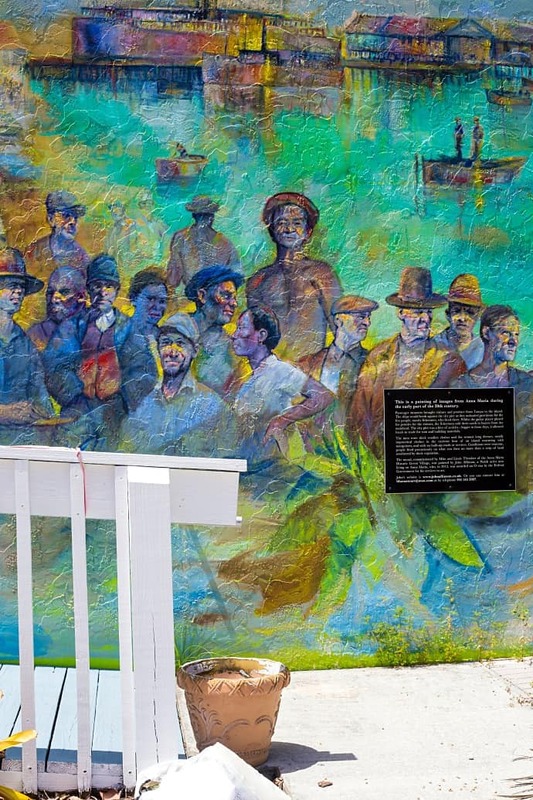 A must-see on your trip to Anna Maria! 7.) Have a Beach Day – With Anna Maria being a barrier island in the Gulf of Mexico, you cannot visit without a beach day! I quickly fell in love with the turquoise water and white sandy beach. Remember to bring sunscreen and plenty of water. 8.) 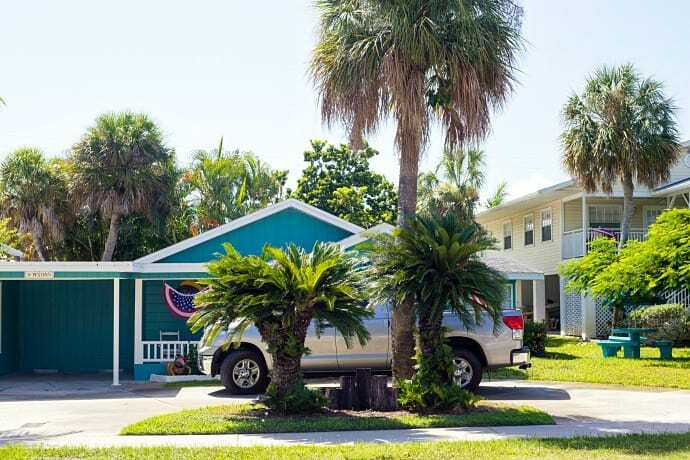 Stay at Tortuga Inn Beach Resort – We were lucky to have stayed at Tortuga Inn. This hotel offers stylish, luxury suites and apartments. The suite I stayed in had a big kitchen with a stove, dishwasher, and refrigerator. Perfect for making meals while you are on vacation. Need to do laundry? No worries because ours was equipped with a washer and a dryer. 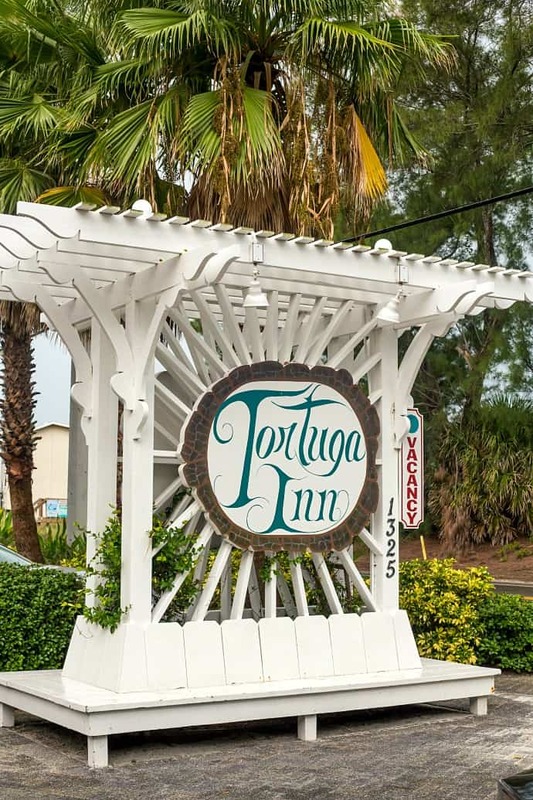 Take a break from the beach and dip your toes into one of the two pools Tortuga Inn has. Or even take a walk around the property and snap a few photos of the amazing landscape. The day we were heading to the airport, I took a little walk around, even in the rain, to capture some amazing photos. Can’t wait to stay there again when the whole family comes down! 9.) 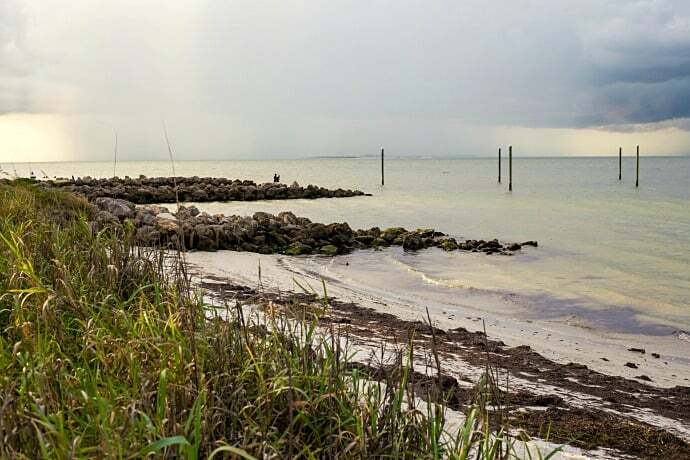 Take a walk on Anna Maria City Pier – I was so excited when we decided to drive to the city pier. We were lucky enough to capture some amazing photos while a storm was rolling in. It made for some great shots, as you can see. At the end of the pier, there was a great restaurant I was told. Can’t wait to try it next time we visit. 10.) Go Parasailing – One memory that will stick with me for life is our parasailing adventure. It’s something I dreamt of and didn’t think I would ever live to tell the story. 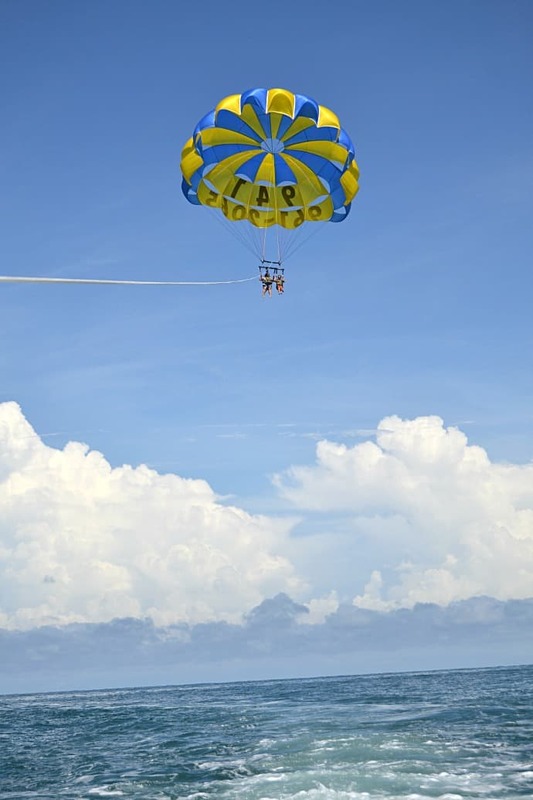 Even if you are afraid of heights, you should go parasailing. When we were half way up, I thought it was perfect, and then we went up even higher, I was a little scared, but I quickly overcame that fear. The views were incredible, and we even saw a dolphin swimming with the wake. 11.) Ride the Monkey Trolley – I think I should warn you, there are no monkeys on the trolley, even though we all agreed there should be! Monkeys are my favorite, and I was a little bummed we didn’t get a chance to ride the trolley. There’s always next time! The trolley travels the entire island (6:30-10Pm daily) from Coquina Beach all the way to the Public Pier on the North Side of Anna Maria. 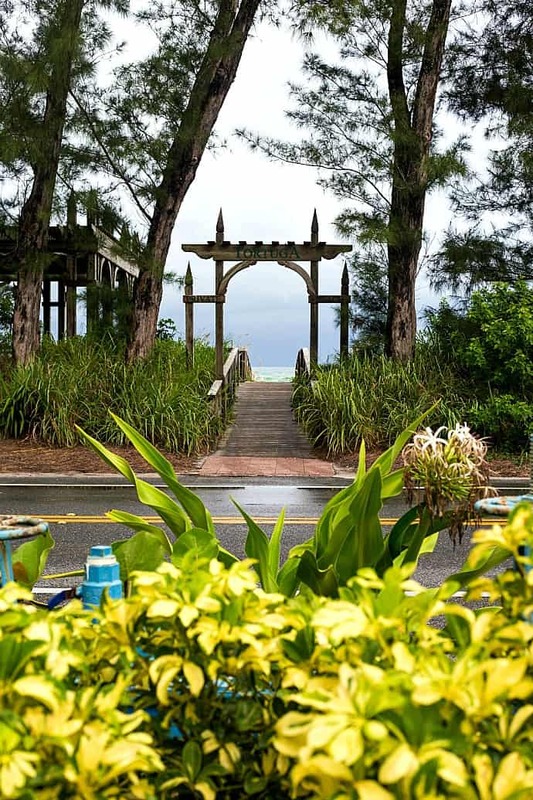 Have you been to Anna Maria Island? What would you add to this list? Intracoastal waterway boat trip with Paradise Tours. Paddle boat cruise from Bradenton Marina. Fish from Rod and Reel Pier. Live music at Bridge Street Bistro. Sunset from the Sandbar Restaurant…..Fab seafood. And please note…The Anna Maria City Pier is closed as of 2018. Sad but true!